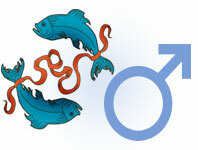 The Zodiac Sign Pisces Man (February 20 - March 20), Pisces Personality Traits for Male born under February Zodiac signs. The Pisces man is a dreamer who prefers to stay in sweet dreams and sad melancholy than to seriously be occupied with the realities of this, by his view, harsh and cruel world. He constantly lives in fantasies of his some extraordinary successful rise and untold wealth, which he is bound to receive for his many talents, but does nothing to somehow bring this happy day closer. The Pisces man all the time waits for a mythical happy fortune, which would finally pull him out of the quagmire. He will eventually become unbearable because of his grumbling in life, eternal depression and complaints against all the people around him. However, if the Pisces man takes the initiative, he can easily create that happy occasion and turn his life into success and prosperity. But for this representative of the zodiacal circle, he would have to abandon his old habits and learn new qualities - optimism and activeness. Pisces man must learn to take firm decisions, implement real ideas, and finally get rid of unnecessary aura of reverie, which obscures him and interferes with normal forward movement. Pisces man is a representative of one of the dual zodiac signs, which tends to fluctuate in decisions, doubt in the correctness of his actions, mark on the same place and move away from problems in the hope that they will be solved by themselves. With such an attitude to life, if he does not train himself, he will become just a guest at someone's feast in the later years of his life, or will try to become a fish-parasite latched on to someone else's success, and collecting the crumbs from the master's table. It is a pity that the Pisces man always has a mass of talent, and with adequate attitude towards life he can actualize his own activities. He has a rich, subtle intuition that can be combined with his intelligence, education and creativity in the best possible way. When all the ingredients of this cocktail are balanced, the Pisces man begins to move towards reasonable goals, and will almost immediately begin to win. In this case, the representative of this zodiacal constellation through a very short period of time will have success and wealth, and perhaps even power. Most Pisces men believe that what they already have is enough, and that they need not rush into the muddy waters of life. The Pisces man is not only careful - he is a coward, and prefers a clear space of modern life to an obscure closet of the future palace. Pisces man's romanticism is very airy and pretty, but only when he does not substitute it for his practical caring about the family and its well-being, including material well-being. In the second version, his romanticism may look like a mockery of common sense of which not all his partners may withstand. He also sees nothing wrong scrounging off his wife or elderly parents, and write romantic opus about his rich spiritual world. The Pisces man can be a truly great man, the backbone for the family and his loved woman, if he comes to his senses in time. Pisces man's love is riddled with romance and passion, novels write about such love and it is composed in songs. It will beautifully court his lady, write poems and sing serenades under the window. He really needs an understanding partner, but she must remember that Pisces man's restless and turbulent soul sometimes needs freedom and solitude, so as to seek his inspiration in them. Pisces man needs commendation, support and words of love. This will not let him lose the thread of romantic relationship that have developed between the partners in their very beginning. Full description of Pisces Man, character traits and personality characteristic for male Pisces.